The advantages of this agreement for the E.U. are also considerable. By insisting on political and economic reform, it would strengthen the proponents of an open society in Ukraine and promote stability on the Union’s eastern border. The text of the Association Agreement was initialed by the two sides in March 2012, and last July the free trade component of the accord was also initialed. The agreement has not been signed since because of ongoing E.U. concerns about the anti-democratic policies of the Yanukovich administration. These include the arrests of Yuri Lutsenko, another opposition figure, in December 2010, and of Tymoshenko in August 2011, and the irregularities in last autumn’s parliamentary elections. At a E.U.-Ukraine summit in February, Herman Van Rompuy, president of the European Council, said the E.U. would like to sign and ratify an Association Agreement with Ukraine by the time of the Eastern Partnership Summit in Vilnius in November. For this to happen, the E.U. is looking for progress in Ukraine’s handling of three issues: prevention of selective justice, elections with international standards, and other reforms as defined in a jointly agreed Association Agenda. To ensure that the agreement would be ready by November, the E.U. would like to see clear signs of progress by May. The most persuasive steps that the Yanukovich administration could take would be to free Tymoshenko and Lutsenko. Since returning to Kiev after the summit with the Union, Yanukovich has expressed a willingness to consider pardoning Lutsenko, who in February 2012 was convicted of embezzlement and abuse of office. But he has still shown a reluctance to release Tymoshenko, who in October 2011 was convicted of abuse of office. This is no surprise. She is the most able opposition leader in the country: Her release could pose an obstacle to Yanukovich winning the 2015 presidential election. All of this creates a dilemma for the E.U. An Association Agreement with Ukraine serves fundamental E.U. interests. It would also serve the interests of the people of Ukraine and increase the chances that Ukraine undertakes necessary political and economic reforms. But how can the E.U. proceed with Tymoshenko in jail? The answer is to recognize the kinds of incentives that work with the robber barons of Ukraine. The current E.U. position of denying Ukraine an Association Agreement would effectively sanction the entire country for the sins of the Yanukovich administration. It might also strengthen the hand of the truly backward-looking minority in the country that would prefer the customs union with Russia to the prosperity of a free trade agreement with the E.U. But it does not impose a high cost on the Yanukovich administration and its supporters for their misbehavior. The threat of sanctions against those responsible for the incarceration of Tymoshenko and the electoral irregularities last autumn are much more likely to achieve the desired results. Officials in Ukraine who complain about “the imposition of Western values” like the rule of law are certainly fond of their Western bank accounts and European residences. They love sending their children to Oxford and the Sorbonne. The possibility that they might be denied such things will have two immediate consequences. The first is that well-placed officials will not want to be involved in actions such as the jailing of Tymoshenko that could bar their access to the West. The second is that some influential people in the Yanukovich camp who never bought in to the repression against the opposition would have strong reason either to demand an end to these policies or to distance themselves from an odious administration. Late last year, the U.S. Congress passed and President Obama signed the Magnitsky Act, which prohibited entry to the United States and use of the American banking system to Russian officials involved in the jailing and death of the Russian lawyer Sergei Magnitsky. 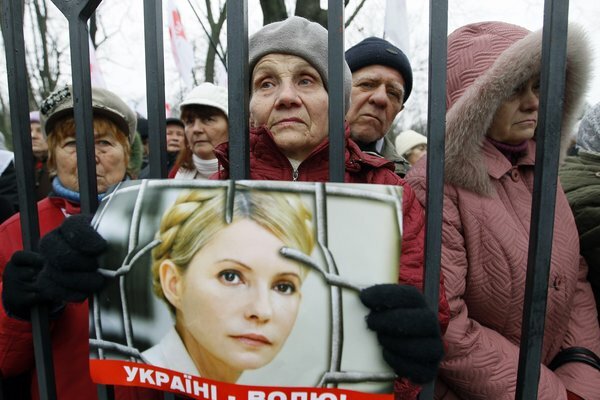 Similar legislation directed against Ukrainian officials involved in the incarceration of Tymoshenko and other political prisoners would be highly effective. The E.U. could proceed to develop such legislation and to seek its passage in tandem with signing the Association Agreement. Using these two tools, the Association Agreement and Magnitsky-like legislation, would enable the E.U. to cover all of its interests in Ukraine: developing the closer economic and political with its eastern neighbor and promoting reform. The Ukrainian people would welcome both the economic opportunity represented by the accord and comeuppance for corrupt leaders. John Herbst is director of the Center for Complex Operations at National Defense University in Washington and a former U.S. ambassador to Kiev. A version of this op-ed appeared in print on March 30, 2013, in The International Herald Tribune.